And leave the work to us. 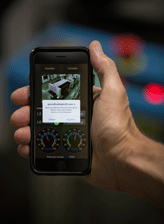 Get a simple, effective mobile operator interface—your own custom mobile app designed specifically for your automation systems and equipment—without having to build or configure it yourself. Request a free half-hour consultation from an experienced Opto 22 application engineer. Get all your questions answered and see if groov is right for you. If you're in the U.S.A. or Canada, complete the form at right. If you're not in the U.S.A. or Canada, contact your local distributor for more information. Keep me informed about groov! © 2013 Opto 22. All rights reserved.